Meditation: So simple it is almost impossible. Meditation is about losing your mind…. in a way. I’m not talking about going crazy, just removing our compulsive relationship with thinking for long enough to give the mind a break. Sound appealing? Well, I can tell you now, I’ve been trying to do this for years and it’s not so easy. I am by no means an expert, but maybe that’s a good thing. I’m not going to tell you meditation is simple, when most days I find it almost impossible to quieten my monkey mind. 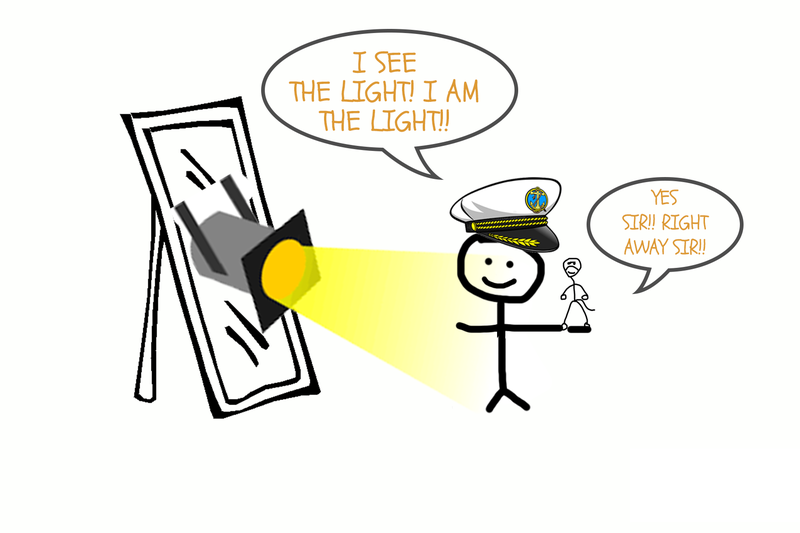 I’m doing this because I know, that for many of us, the true nature of who we are (call him/her Captain Awareness) is barley ever even given a look in. 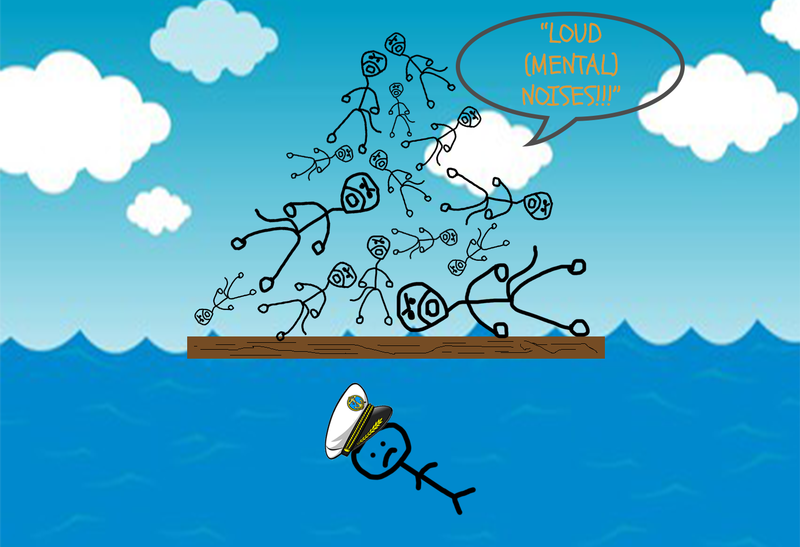 Instead, he’s usually drowned out by the constant mental noise of an unruly mind. This would all be well and good, but according to a Harvard study (as well as common sense) “people spend 47% of their waking hours thinking about something other that what they are actually doing, and this mind wandering typically makes them unhappy.” Not only unhappy I’d bet and anything but free. It’s time to ‘wake up’, don’t you think? The benefits of meditation and mindfulness are indeed ubiquitous, from the celebrity endorsements to the scientifically proven health implications. And we all know how the mind likes a nice juicy slice of quantifiable evidence. “Mmm, it must be safe and worthwhile now science says so”. But, who needs science when we’ve got a healthy curiosity and the ability to find out for ourselves? This is what got me started some years ago and, man am I glad it did. The only way to describe one of my early attempts was, well, shocking. I was hooked or, at the least, highly intrigued. The only way to describe the experience is that I was completely aware, but without a thought in my head. Inevitably, the first thought arrived and jolted me out of the relaxed stillness I had been enveloped by. The whole thing would have been negligible only that 15 minutes had passed by in what seemed like a nanosecond. Maybe it was beginners luck or maybe I was so far lost in my own head, even the smallest timeout from thought seemed like divine revelation. Anyway, It was enough fro me to know there was more to meditation than scientific brain wave statistics or increased memory function. Little did I know this 15 min experiment with the unknown was to grow into what has now become a lifelong affair. It was still a novelty back then. Something with promise. Something I knew there was so much more to, yet still lacked the discipline or burning desire to give it more time. Today, sadly, I’m not convinced that the hype, endorsements or proven health benefits are enough for many people to give it a shot. I mean, if we always did what we knew was good for us, we would all be just fine, right? I strongly believe we need to have a good enough reason if we are going to commit to making this a part of our lives. And the best way to find our ‘WHY’ is to experience the benefits first hand. This also means we need to give it a chance for long enough so the benefits become clear. “Unless the intellectual dimension is reinforced by the experiential, it never really becomes a life altering process.” ~ Sadhguru. The more I’ve practised, the more I see that meditation is essential for well being. This is increasingly apparent with the level of information we are now processing on a daily basis. How else can we combat the attention deficit disorder encouraged by the incessant beeping of our smart phones? It is now clearly evident that the powers that be in the tech world (the social media giants) are blatantly exploiting this weakness in our psychology. By, feeding us little nuggets of serotonin every two minutes we are kept hooked as we chase the next notification, like or comment. Hopefully, clicking on ad or two as we do. In many ways, we are just hamsters to the giants of social media, the more milage we clock on the (scroll) wheel, the more we bank for them. No one can fix this, but us. We have the power and we must take back responsibility for our own minds. When you consider that the mind is on non-stop and around the clock (even in dreams), surely it must only be common sense to give it a rest every now and again. Yes… surely it must be… but, why do the majority of people find this so difficult to do or even attempt. Let’s dig a little deeper. The mind doesn’t behave like any other part of the human system but, what if it if it did? Can you imagine an out of control hand or leg that does not follow orders. You could be walking down the street and BAM! out of nowhere, a Michael Jackson style kick, crotch grab and ‘a Heee, Heee’ would leave you mortified. An entertaining case of turrets, to an onlooker maybe…. not so much to it’s operator. Just imagine if people could see every nonsensical thought that was bouncing around in our minds. We wouldn’t be able to leave the house! It is undeniable that, for the most part, our minds are not taking orders. For example, we can suffer something that happened years ago as if it was today. Not to mention that which has never even happened. Therefore we can suffer that which does not exist. I’m not sure on the exact definition of insanity, but surely this comes close. Of course, it’s not so bad, we’re all in this together. Besides, the majority of us have got our sh*t together just enough to function as good, law-abiding citizens. So, if we’re lucky, we’re at a socially acceptable level of insanity. We’re ‘normal’, Yay! — our only solace. I don’t know about you but I have a sense that something is not quite right with this scenario. So, if you’re curious and are looking for something more than solace, read on. Who wants to be normal anyway, eh? 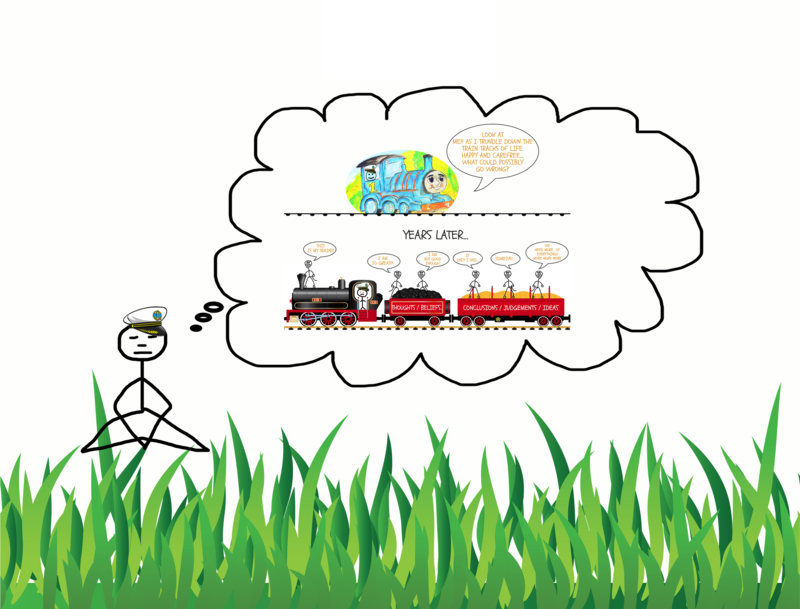 The mind is like a train. It starts off its journey as an innocent and fun-loving ‘Thomas the Tank Engine’ that is unburdened by the baggage of life experience. 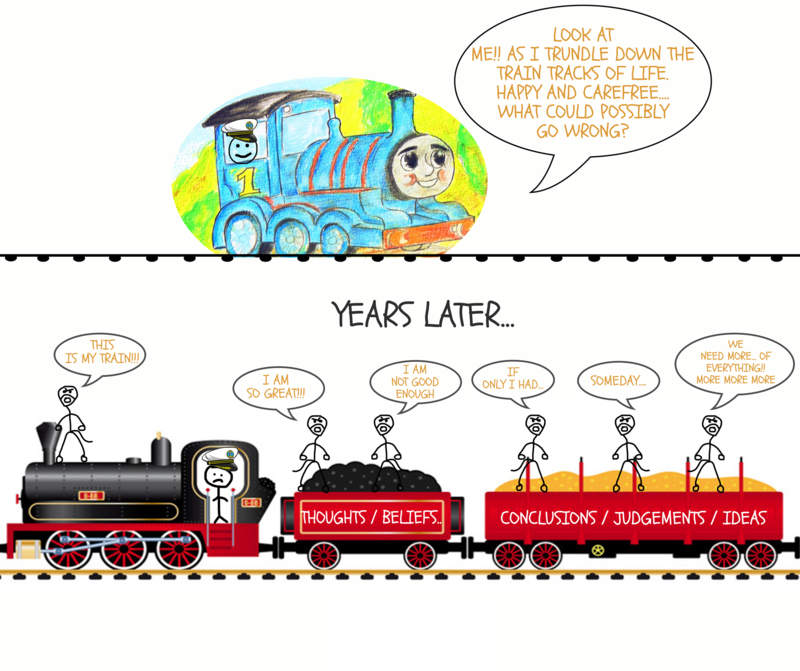 As it trundles down the perilous track of life, the mind slowly transforms into an unstoppable freight train that carries an incomprehensible cargo load of thoughts, beliefs, conclusions and judgements. There is a reason we are carefree as children, we’re not carrying such a heavy load — the burden of difficult life experiences. Of course we must ‘grow up’, find our way and fit into whatever reality and social construct we’ve been lucky (or unlucky) enough to find ourselves in. C’est la vie and on we go, loading up the necessary data to function as a productive member of society and a good human being. Somewhere along the way, with the desire to find our place in the world, we forget all about our carefree nature and become deeply entangled in the psychological aspect of ourselves. We form a sense identity and cling to it for dear life. We drive forward, unconsciously loading up as much information as possible in a never ending quest to feel complete. 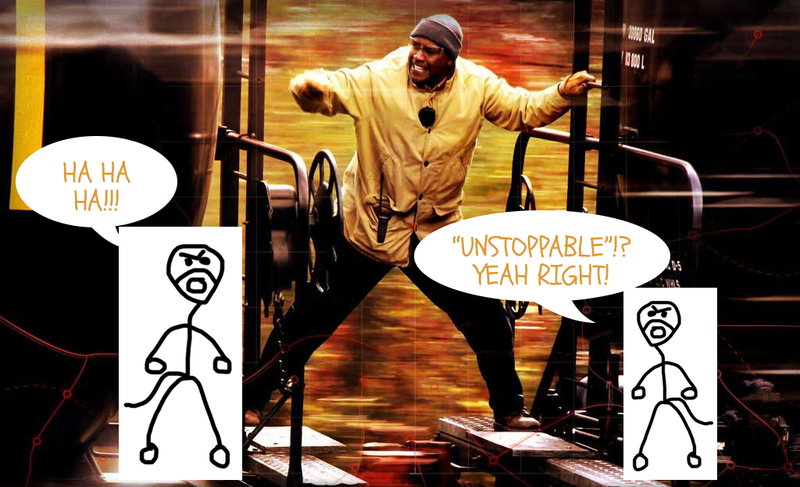 Eventually, we reach a point where the mind has built up so much momentum not even Denzel Washington could slow it down. If we’re lucky, we have a sense that something is not quite right with this narrative and we start to search for a solution. If we don’t… well, ‘Choo Choo!! !’… hopefully we will enjoy the ride. This is where meditation enters the scene. To save the day by slowing down and hopefully stopping the train. This is also where things can often hit the fan. We begin to realise just how out of control the mind actually is. Trying to force the mind to stop at will is futile. In fact the very desire to do so will just result in a more agitated monkey (mind) and the train will speed up. Therefore it’s time to outsmart the monkey, give it a job so it feels important enough to leave you in peace for a while. It needs an object to focus on, with the breath or a mantra traditionally being the most common. Unfortunately even with an object of focus it can seem like your fighting a losing battle. Depending on the day, your monkey may just be too far gone. Maybe it would help to understand how this monkey has become such a dictator in our lives in the first place. The fundamental issue here, is that it has been so long since we have known the carefree splendour of childhood that we now believe ourselves to be the monkey, the train and all the cargo we have gathered on our journey through life. Can we really trust the information we have gathered? — the ever-changing plethora of beliefs, judgements and conclusions we have. Sure, they make us feel safe and smart, but is it possible that the information recorded is flawed? They say the eyes see only what the mind is prepared to comprehend. In fact, modern science proves that we can only perceive a tiny percentage of actual reality through the limited faculties of the five senses. It would only take one tiny, misconstrued belief or experience to limit and taint our whole world view and self-image. Of course, we needed some basis to function in the world, so we identified our true ‘Self’ (Captain Awareness) with a never-ending list of things we are not. But, now we have matured it’s time to see that we are not the ‘cargo’: the content of our mind. We are not the train. We are not even on the train. In fact, it is a ghost train, hijacked by the phantom of ego — the ‘monkey mind’. It is a train formed by a complex amalgamation of the traits we come into this world with combined with our whole life experience to date. It is a beautifully unique expression of what you’ve gathered, but, it is not you. You are the Captain. You are the one observing the train as it speedily hurtles down the track of life frantically searching for more ‘stuff’ to gather in an effort to feed it’s insatiable appetite for more. More accomplishments. More achievements. More experiences… more ‘stuff’. That’s not to say there’s anything wrong with it. It is what it is. The only thing that needs fixing is our relationship to this ‘stuff’ and our ability to focus on what matters to us. No, you cannot be the train or anything on it, for whatever you observe cannot be you. Therefore, the core of who you are is totally separate from the mind. You are the boundless and unchanging observer and you are already completely free. Your only job now is to identify who you are with this. The more you do the more the light of awareness will shine through, illuminating every facet of your life. Meditation is the formal practice of repeatedly remembering this, over and over again until the amnesia ends and the ‘Thought Train’ grinds to a halt. This is the beginning of a role reversal, where who you really are begins to become the master and not the slave. With your true nature back in the ‘driving seat’ again your mind becomes your greatest ally and a tool to live life on your terms. You can play with and get involved in the whatever is happening on the train as much as you like, but all the while you keep on remembering and thus remain rooted in your true nature. Unshackled by any false, self-limiting beliefs, conclusions or judgements, you become free of fear. Free to live life to your full potential. Focus is the key for making progress with anything in life and the same goes for meditation. Unfortunately it’s not something that is thought in schools but it can be practiced in all aspects of daily life no matter what you are doing. You do this by practicing mindfulness – giving your full undivided attention to whatever it is your are doing in that moment. Forget multi-tasking and concentrate on one thing at a time. For me, the core purpose of meditation is to bring us back in contact with our true selves and with truth itself. As we do this consistently we begin to become more conscious in our daily lives and therefore happier and more effective. When you consider the train analogy, the main contributor to the way in which our lives unfold is the cargo we have gathered and our awareness of/relationship to that. Whatever the case may be, a key step to taking control back needs to be accepting total responsibility for our lives and everything in it. We must accept that whatever our life contains right now is our doing; good, bad or indifferent. Because, it is only when we do this, that we have any power over it. “Yesterday I was clever so I wanted to change the world, today I am wise, so I am changing myself”. In my own life, becoming more aware of the unconscious thoughts and behaviours that have shaped my self-image and external reality has been nothing short of life changing. It is an ongoing process, both interesting and challenging simultaneously. I’ve become much more aware of (the mostly contradictory) ‘nonsense’ going on in my mind. Petty judgements, false beliefs, fears and anxieties — the whole kit and caboodle. 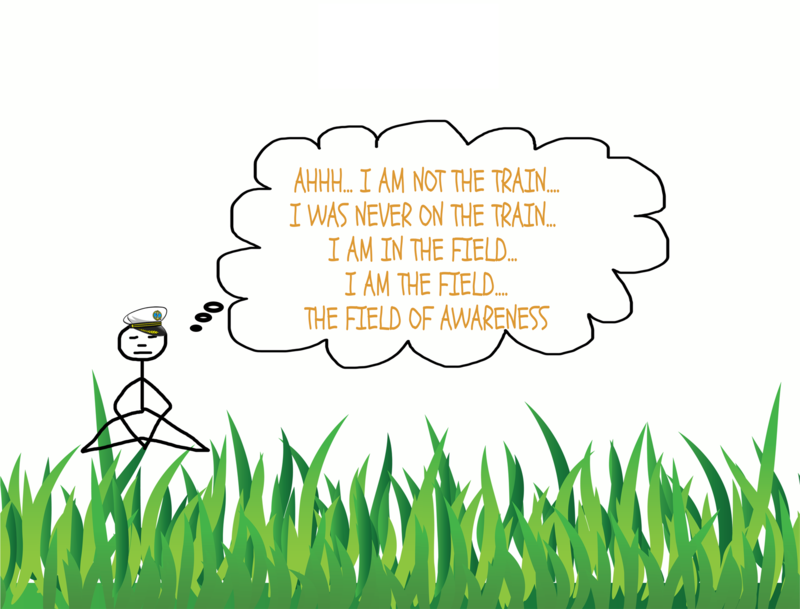 While this is quite challenging to process and deal with it is also hugely fulfilling to know that there is a clear separation between ‘me’ (captain awareness) and what I have gathered (the monkey and the thought train). We have reached levels of comfort today unimaginable to a king just a few hundred years ago. Sadly this does not seem to have made much impact on our levels of happiness. The reason for this is due to the unfortunate neglect of our inner well-being. We must realise by now, that fixing the outside situation does not fix the inside. It never will. The mind will never cease to want more because it can never be fully content with what is. That is it’s nature. All happiness comes from awareness. The more we are conscious the deeper the joy. To build awareness and become more conscious we must journey within. Meditation is a tool for that journey. A tool we can use so that we can live better and ultimately discover the nature of who we are deep down. They’ve been telling us for thousands of years to ‘Know Thyself’ so maybe it’s time we began to listen. Like anything of value, the benefits must be experienced first hand and the only way to do that is to find out for yourself. Hopefully this article has shed a smidgen of light on the topic, sparked your curiosity and encouraged you to investigate further. Why not give it a try right now? for just 5 minutes sit with your spine comfortably erect. First, feel the weight of your body on the chair, then simply focus on the flow of breath. When you inevitably lose presence simply remember that you are not the train. Wonderful article Kieran. A fine description of the nature of the mind and some great insight how to cultivate self awareness. I just ordered the journal….looking forward to make use of it daily.